Derby City Council has announced plans for a new £10m ice rink which will be showcased at MIPIM this year. The rink, which will measure 56m x 26m, will hold 500 people and include a gym, dance studio, changing rooms and café bar. It will be aimed at public skating and training for ice hockey teams and there will be a training area for professional skaters. 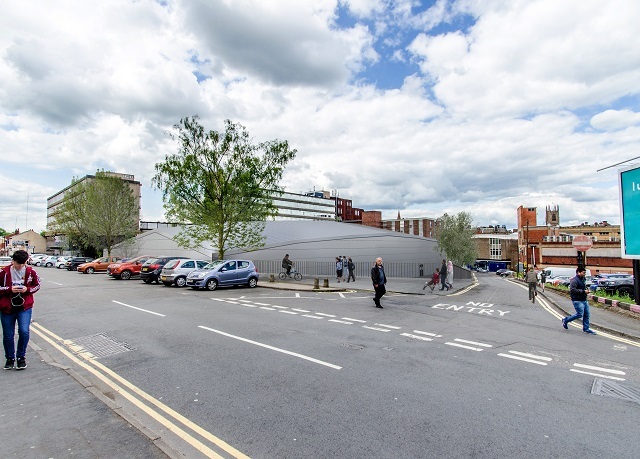 The new ice rink will be built on Duckworth Square, a key site marked for regeneration. Derby City Council is currently in the process of acquiring the former Debenhams building, with plans to have the rink up and running by 2020. It is projected that the development will generate about 250 direct and indirect jobs and bring an investment of about £30m. Martin Rawson, deputy-leader of Derby City Council, said: “Since September 2014, the council has been consolidating land ownership in what has become known as the Becketwell area of the city by buying up former shopping precinct Duckworth Square, acquiring Debenhams and also purchasing properties in Green Lane and Macklin Street. “We are taking the lead to reinvigorate Becketwell into a vibrant leisure, retail and residential area but we are open to proposals for alternate viable long-term leisure uses for the site”. Specialist consultants IPW says there is a demand for an ice rink facility in Derby. Maria Bertelli, a senior consultant at IPW, said: “Ice rink operators throughout the country have shown an interest in running the facility and want to invest in Derby. Our model will ensure a self-sustaining centre that will not call upon council subsidy to run it. “The city centre location will provide a footfall of between 250,000 to 300,000 people and new annual visitors to the heart of Derby will provide a positive regeneration and economic impact for the city”. Derby City Council is currently looking for an operator for the development, with many already expressing an interest. Once an agreement has been signed, the operator will have an input into the design of the facility which the Council would construct. At MIPIM Derby City Council will also be unveiling the latest regeneration opportunities in the “heart of the city”. Derby will be showcasing its economic strength at the Derby City Embassy, to be held at the Eden Hotel on Wednesday, 15th March, which will look at the progress made on key projects since the launch of the City Centre Masterplan. John Forkin, managing director of Marketing Derby, said: “There is a real buzz in Derby at the moment, having attracted £3bn of investment. This year we are looking forward to showcasing the latest investment opportunities from the ‘heart of the city’ to businesses, investors and developers from across the UK, Europe and worldwide”.